This page shows how blocks can be used to help instructors stay organized. 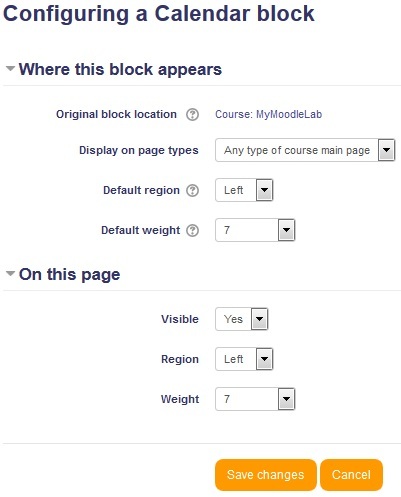 Blocks are the blue boxes which typically appear to the left of your course content pages. They can contain many different kinds of content depending on the type of block you choose. We will use the Calendar block as an example in the instructions below. In the upper right, click on the orange button that says Turn editing on. Scroll down to the bottom of the page. In the lower left, click on the drop-down menu under "Add a block" and choose the type of block you want to add. The options available for configuring your block depend on the type of block you're working with. However, all blocks have some basic settings that can be configured. Click on the gear icon under the block's name to open a drop-down menu. Select Configure______block in the menu. (In this case, "Configure Calendar block"). Set the configuration settings as desired. Generally you can leave all of these at their default settings. It is generally recommended to make the "Where this block appears" and "On this page" settings the same. Use the "Default region"/"Region setting to make your block display on either the left or right. The "Default weight"/"Weight" setting allows you to assign a ranking to the block which will determine how high up it will appear on the page. -10 puts the block at the very top and 10 puts the block at the very bottom. The Administration block is -9 and the Navigation block is -8; thus, these blocks always appear at the top of the list of blocks in that order. Click on the gear icon under the block's name. Select Hide_______block next to the eye icon. (In this case, "Hide Calendar block"). To show the block again, click on the gear icon and then Show_____block next to the crossed out eye icon. (In this case, "Show Calendar block"). Click on Delete_____block next to the X icon. (In this case, "Delete Calendar block"). A message will display in the center of the page asking you to confirm your action. Click Yes to confirm it.